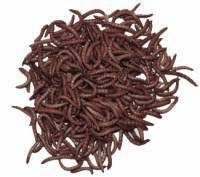 Lab Supply has a great selection of live worms and insects available in our online store today. These mealworms and superworms work great for animals that have the need to forage for live insects. These insects can be placed in the fleece foraging and grooming boards and can add to the mental stimulations of primates and other animals that forage for insects. Prolonged temperatures below 40° F will kill the worms. Shelf life is 2 weeks. If you are interested in the different types of bug treats in our inventory, then please click here to view our selection in our online store. Here at Lab Supply, we are committed to making sure you find exactly what you are looking for. If you have any questions about the live worms and other bug treats that we offer, then please click here to visit our contact page. We will be more than happy to answer any questions you may have.